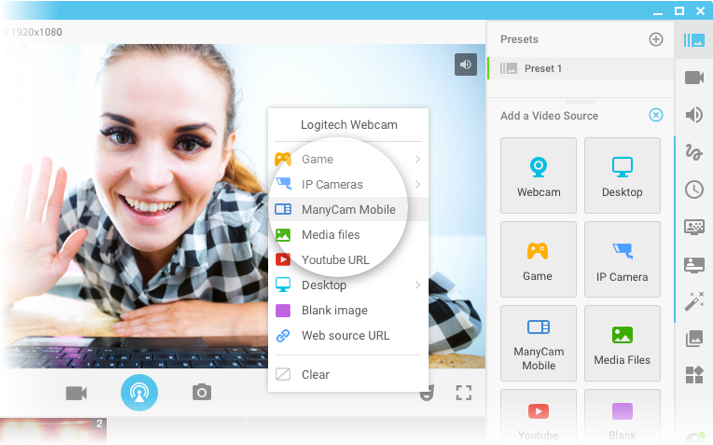 ManyCam offers a variety of video sources that you can use in your broadcast. 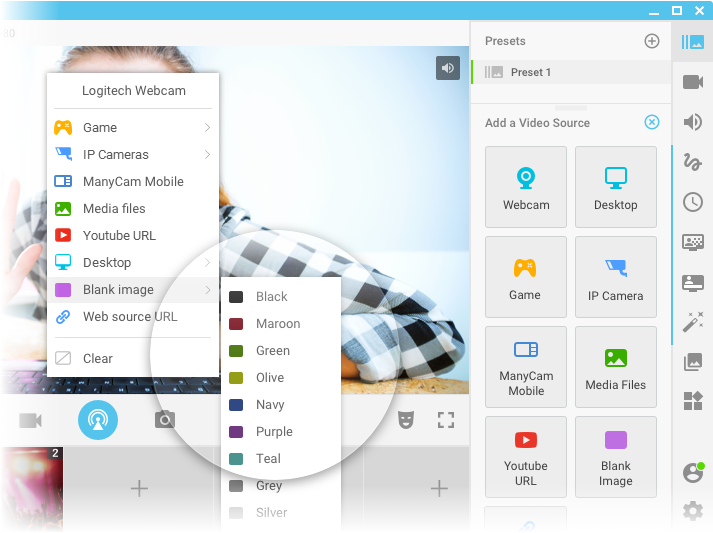 You can add a single video source or combine multiple video sources depending on your workflow (see how to add multiple video sources). Right-click on the Main Live window to see the full list of video sources available in ManyCam. Another way to add a new source to your stream is through the Preset toolbox on the right, next to Video sources (click on the icon to see all options). All of your webcam options always come first on the list of video sources. 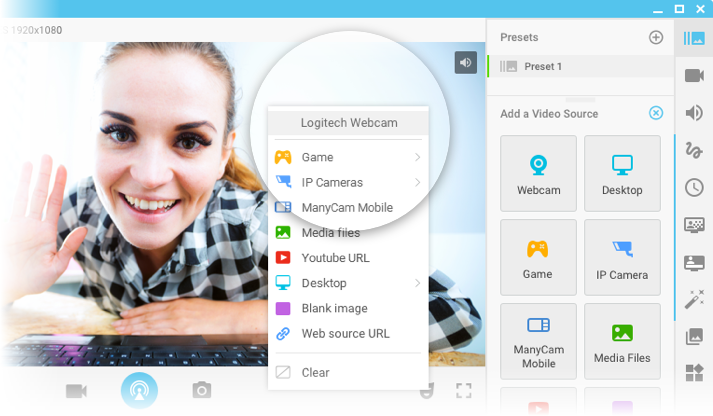 In case you don’t see your camera on the list or receive an error message when you select your camera, please refer to these articles: ManyCam and Capture Devices, Can’t start video. 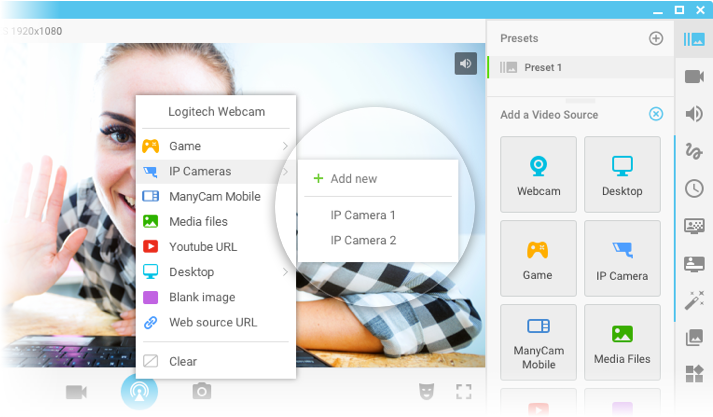 Here you can select an IP camera as a ManyCam video source. By default, the list is empty until an IP camera URL or IP addresses are entered. 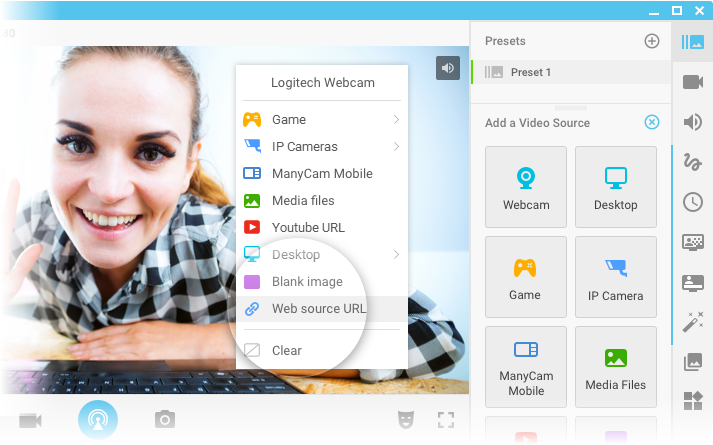 Learn how to connect your IP camera. ManyCam mobile app for Android and iOS allows you to use the camera of your mobile device as a remote video source for your ManyCam Windows application. Find out more about ManyCam mobile! Here you can choose media files stored on your computer as an output image. 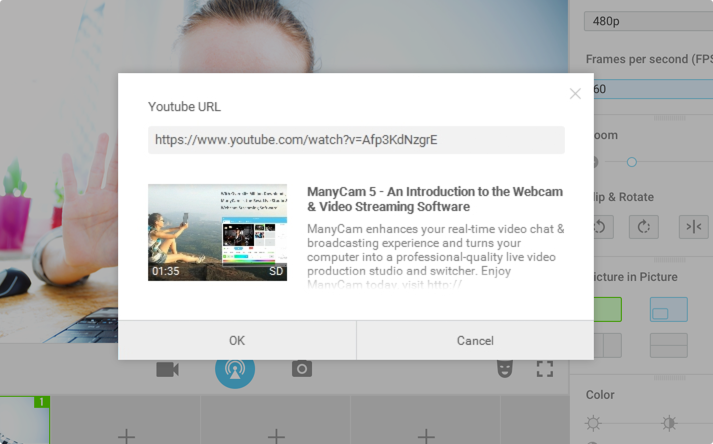 This feature allows you to stream YouTube videos in your Main Live window as an output video feed. 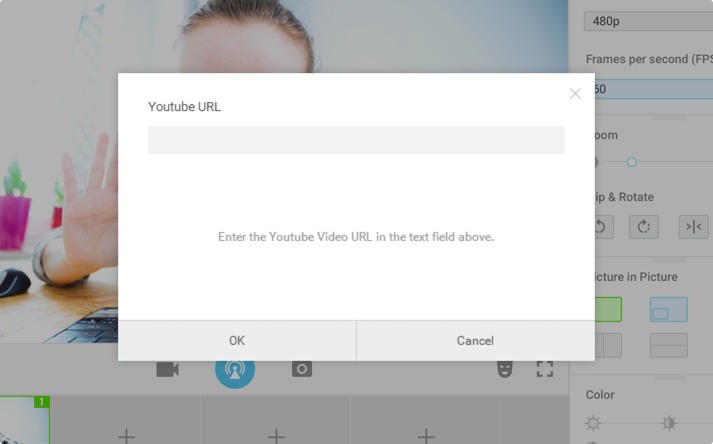 Paste the YouTube Video URL in the field. You can pick the quality of the video by clicking on SD or HD indication in the bottom-right corner of the preview image. Press “OK” to use the video as a source in ManyCam. The ManyCam Desktop capture features allow you to grab frames directly from your desktop. 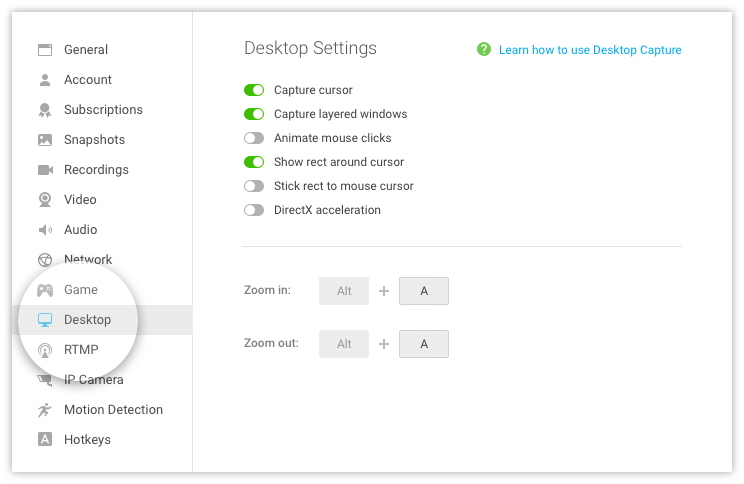 You can grab and screencast your entire monitor, a custom selected area, a particular application window or the area under your cursor. 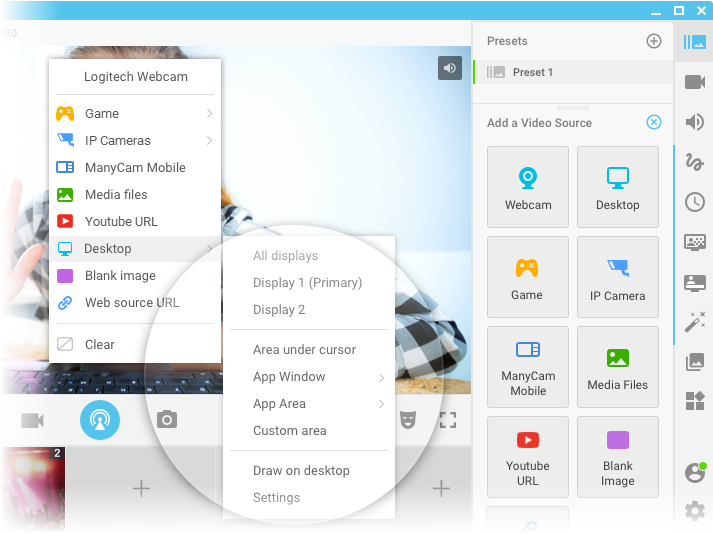 Capture your entire desktop area and use it as a video source in ManyCam. If you have more than one monitor, you will be able to capture each of them independently or both at the same time. Area under cursor option allows you to capture a custom sized area around the cursor. The red rectangle shows you which area is currently being captured. You can adjust the size of the area using the Zoom feature. 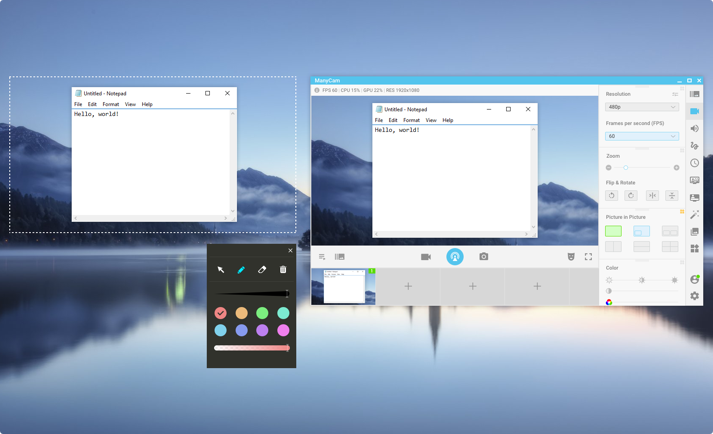 With the App Window option, you can simply capture the desired application window. The selected app will be captured and used as a video source in ManyCam. Other apps will not be captured when they appear in the foreground of the selected app. Use App area to capture a portion of your screen occupied by a specific application. The capture area will lock to app window you picked from the list and will stick to it’s size while you capture. Anything that appears in the foreground of the selected app will be captured and displayed as a video source in ManyCam. Custom area is used to capture a specific portion of your screen. This mode provides a convenient movable canvas so you can see the area that you are capturing. You can also drag and resize this area. Draw on desktop feature allows you to draw directly on the desktop capture. Please note that you most likely want to use this feature along with one of the other desktop capture modes (e.g. Custom area or Fullscreen) because this drawing tool doesn’t do the capture for you. Advanced capture settings are available in the ManyCam settings dialog. Defines whether your cursor will be visible on the video feed. Uncheck this option to slightly improve performance. As a drawback, some menus may not be captured so do this at your own risk. By default, there is an animation around your cursor when you press left mouse button. Uncheck this option if you want to disable it. Set up hotkeys for Zoom-in and Zoom-out actions. Shows red rectangle around your cursor while zooming or in “Area around cursor” mode. When using Zoom or “Area around cursor” mode, you can choose whether to move the area immediately after the mouse was moved, or make it follow the cursor. You can use a blank image as your video input source. You can choose the background color. 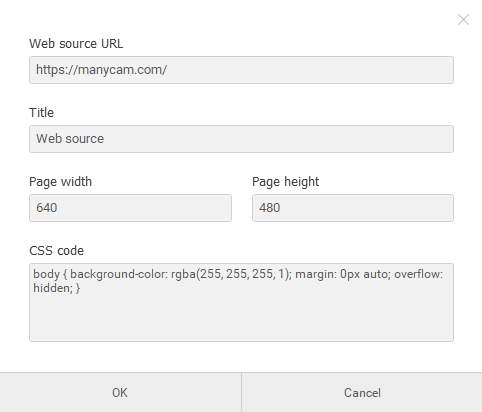 You can choose Web source URL as a video source to broadcast any web-page with ManyCam. Select Web source URL and paste a URL you want to broadcast into the “Web source URL” field. In this step, you can also set a custom title, adjust the width and height you want to fit the web page into and add a custom CSS code. Please note that interaction with the web page added as a video source (clicking, scrolling, etc) is currently not supported.